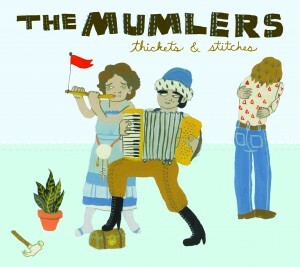 Thickets and Stitches, the debut album from San Jose oddballs the Mumlers, is a forest of off kilter lyrics & rock & roll instrumentation embellished with swelling brass, plaintive slide guitar, singing saws & other sound-making devices. The band’s refreshing blend of lighthearted stage presence and seriously well-crafted songs has won them fans all over the West Coast, including accolades from the press and inclusion in the prestigious Bleeding Edge and Noise Pop festivals. They have played shows with indie stalwarts such as Yo La Tengo, Clinic, Matmos, Money Mark, and labelmate Tommy Guerrero. Thickets and Stitches is a portrait of a young band in love with music, exploring various textures and creating something satisfyingly original. There are crowd-pleasing mid-tempo rockers (“Red River Hustle”), mesmerizing ballads (“The Hinge’s Lament”), call-and-response soul stompers (“Shake That Medication”) and songs that defy easy categorization. In an effort to maintain warmth and spontaneity, the album was recorded live to two-inch tape with minimal overdubs. All songs were written by Will Sprott & performed by the band with the exception of cameos by the singular talents of The Legendary Stardust Cowboy (bugle) and Sarah Jo Zaharako of Gojogo (violin). The majority of tracks were recorded at Snowghost studios in rural Whitefish, Montana, by engineer Brett Allen. Additional material was recorded closer to home at various studios including with Tape Op magazine publisher John Baccigaluppi at the Hangar in Sacramento, CA. Some time later the tracks were mixed by Thom Monahan (Brightblack Morninglight, Devendra Banhart, Vetiver) at the Hangar. Mastering was handled by J.J. Golden (Calexico, Rachel’s, etc.) at Golden Mastering in Ventura, CA.